I seriously don’t enjoy eating Ethoxylate Mono and Diglycerides, Calcium Peroxide, Datem (or uncommonly known as Diacetyl Tartaric Acid Ester of Mono- and Diglycerides), Ammonium Sulfate or even Azodicarbonmide? Like, seriously don’t like it. You might be wondering why am I listing all these unpronounceable words. Well, if you are eating store bought breads, and enjoying them then most probably you do enjoy eating all those long sounding ingredients I just mentioned. And not that I want to scare you or anything (really, I don’t) but calcium peroxide (something common in lots of bread brands out there especially the white flour kinds) is a chemical that can also be used as a fertilizer. Tasty, right? When we make bread at home, usually our list of ingredients is flour, water, yeast, a little salt and some sugar or honey and maybe nuts. But count the ingredients on the label of your beloved store bought “healthy” bread – sometimes the count can go up to 40! Also, just because it says “whole wheat” doesn’t mean it is, and the variety you maybe purchasing at the grocery store may be nothing more than white bread in disguise laden with nasty chemicals and artificial ingredients. Yummy. That’s why I prefer baking bread at home. Or for that matter even other things at home from scratch, if I can. There is so much more control in what goes in. Of course, its not possible always. And I do buy bread from the store sometimes, though I make sure I read the ingredient list at the back and NOT just the what the package of bread says on the front. If I know and recognize all the ingredients, then I’ll buy it, else its back to the shelf. But, if I can, I try to make my own bread at home. Now, if you remember (I bet you don’t unless you are Marilu Henner), that I challenged myself to not buy anymore cookbooks till I don’t make at least three recipes from each of the cookbooks I already have. I finally decided to take myself on that challenge and start a series Cooking with the Books. I will pick up a cookbook from my collection each month, and cook at least three recipes from it. This is an attempt to justify the title of a cookbook hoarder V has given me. I really don’t blame him, but all the cookbooks sound and look so nice and they just call out to me to buy them. I really can’t help myself. And then I buy the book, and look at it. Admire the recipes and the stories. Bookmark the ones I would like to try. But actually end up making something that I saw on someone else’s blog (c’mon there are such amazing recipes out there), or if not that then something from the heart (isn’t that what cooking really about?). And that cookbook that I bought stays in the bookshelf with all the recipes bookmarked, biting the dust. To be fair (to me), I do cook from these cookbooks sometimes, but not as often as I should. Hopefully this series will take care of it. The first cookbook in the series is The King Arthur Flour Baker’s Companion. 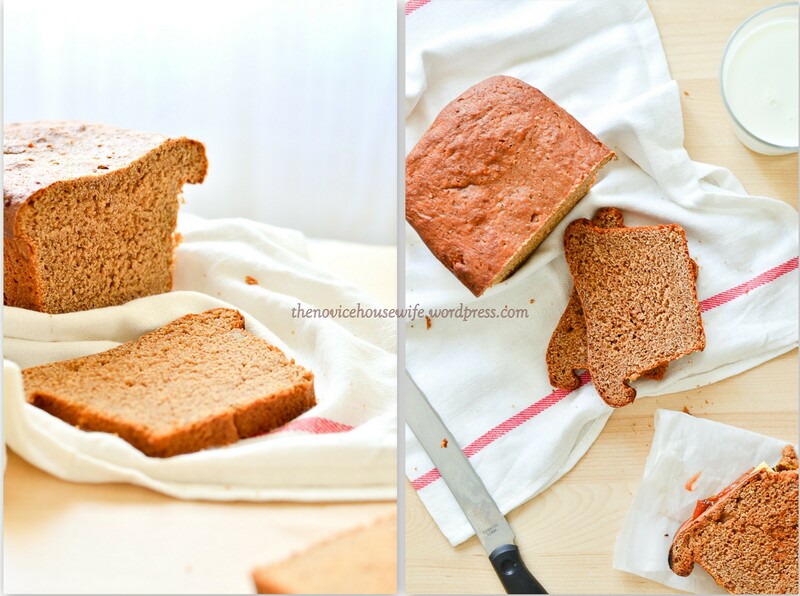 I was flipping through it the other day and found this whole wheat bread recipe. 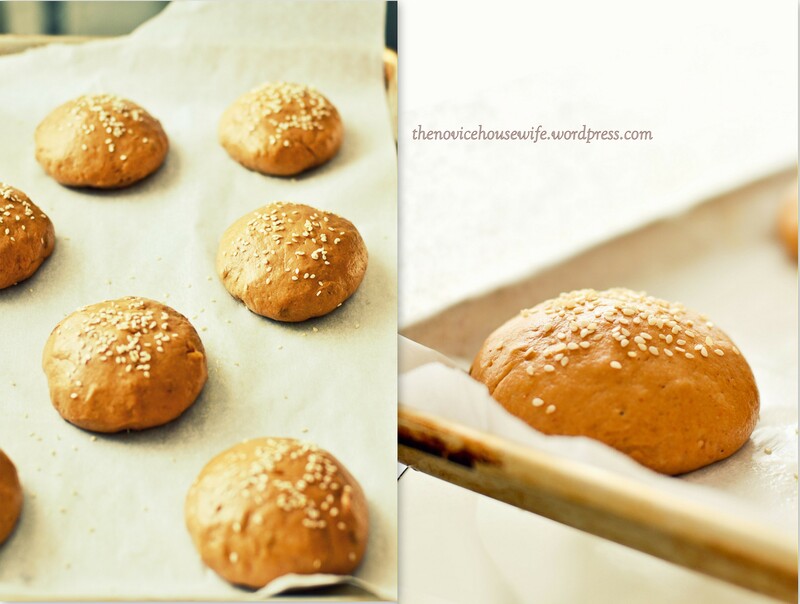 I used it the first time for the burger buns I made for my Soy and Chickpea Burgers. And I was in love. I made it again few days back and love that all the things that I was scared for in my homemade whole wheat bread- being dense, dry and tasteless, this bread is none of that! Instead it is delightfully nutty, and moist. The molasses adds a faint sweetness to the dough, besides giving the bread a lovely hue. 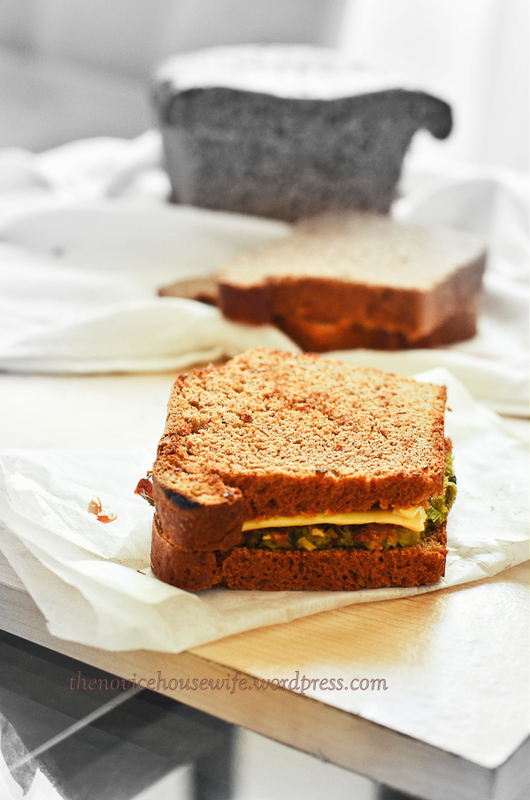 It made for a great sandwich bread for my edamame cutlets (recipe soon) and were an excellent addition to our Sunday brunch! Isn’t it great knowing the bread that you eating has ingredients which you know and recognize and not one of them is sugar or chemical fats. You won’t be disappointed with the results on this bread. Next time I am going to add some flax seeds to make it even more healthy! Adapted from The King Arthur Flour Baker’s Companion. In a food processor chop the walnuts and sunflower seeds for a about 30seconds to 1 minute. Combine all the ingredients in the mixing bowl of a stand mixer, to make a “shaggy”, kind of wet dough. 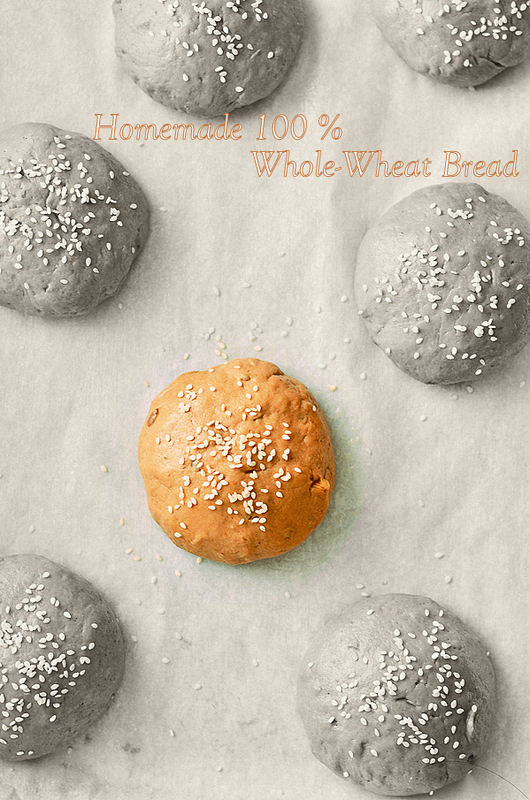 Whole wheat flour takes time to absorb liquids, so avoid adding any extra flour at this step. Let the dough rest for 20 minutes in the bowl, covered with cling film or a dish towel. Once rested, knead for ten minutes in the stand mixer, attached with a dough hook. You can add a little far if you feel its too wet, but do remember this dough will be sticky. The first time I added 1/2 cup flour, because I wanted to shape it into buns, and knew working with too sticky a dough won’t get me the results. 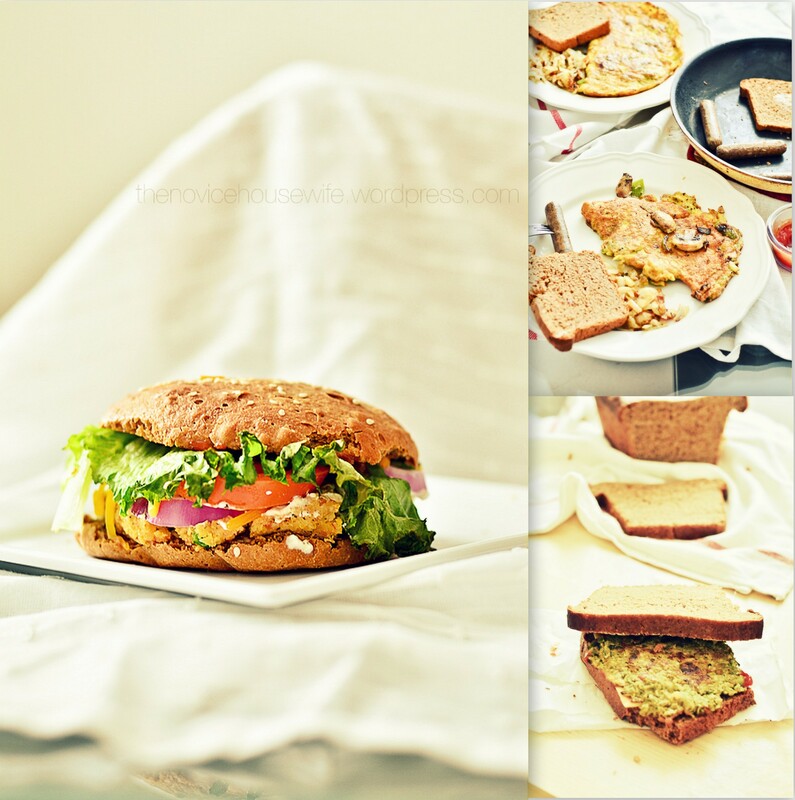 The next time, I added only a tbsp or two to the dough and was fine to work with for making the sandwich bread. Let the dough rise in a greased, covered bowl for an hour. Punch down, and shape it into a log or buns and place in a lightly greased loaf pan or a parchment lined baking sheet. Cover pan with lightly greased cling film. Let rise another hour, until double in size. Preheat oven to 350 F. Bake for 45 minutes. Let rest for 10 minutes in the pan and then remove and let cool completely on a wire rack before slicing it. And I love your plan to cook from all your books–I should probably do that myself. I liked this recipe because it stated ingredients that I already had in my pantry. I bet those granola bars were delicious! I love the KAF cookbook. Finding so many other great recipes to try! 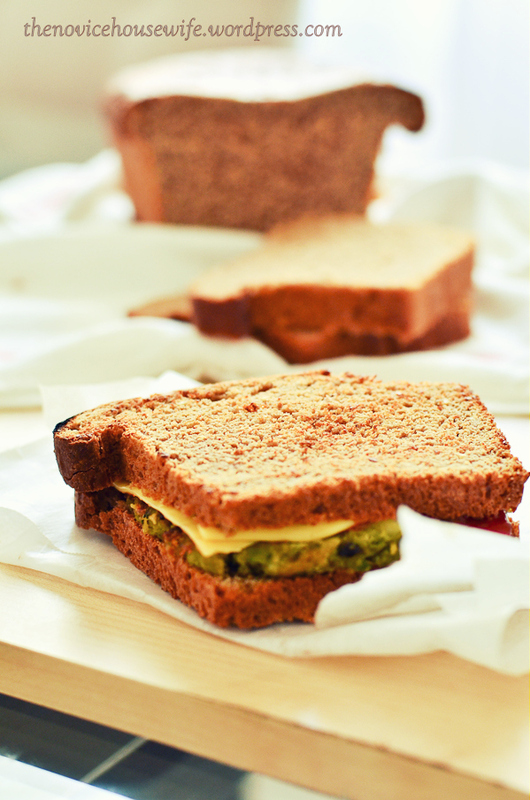 Those big words don’t sound so yummy… Your bread looks delicious! 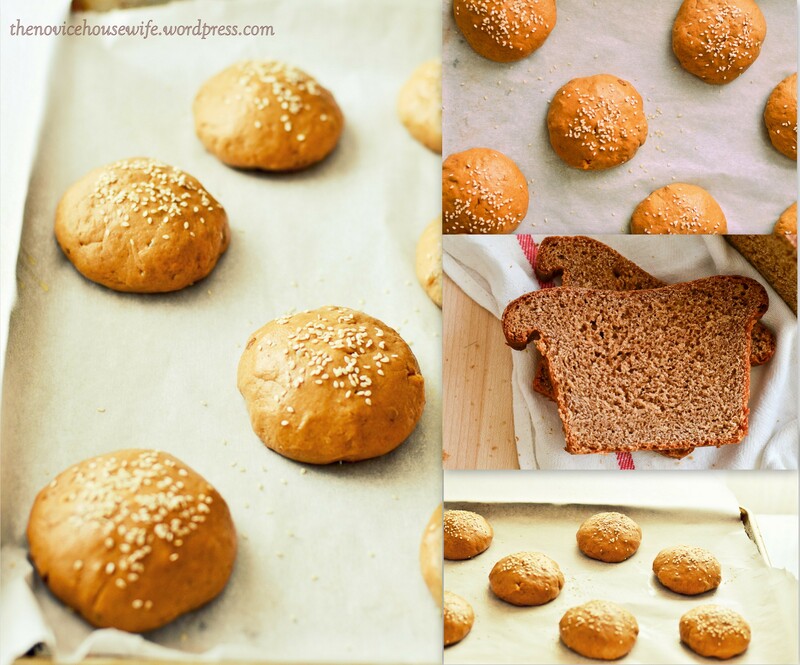 You’ve inspired me: first, to try this whole wheat bread recipe; and second, to try at least 3 recipes from each of my cookbooks. I, too, buy them, admire them, then let them sit on the shelf because I keep trying recipes from other bloggers! I don’t like eating things I cannot pronounce either. 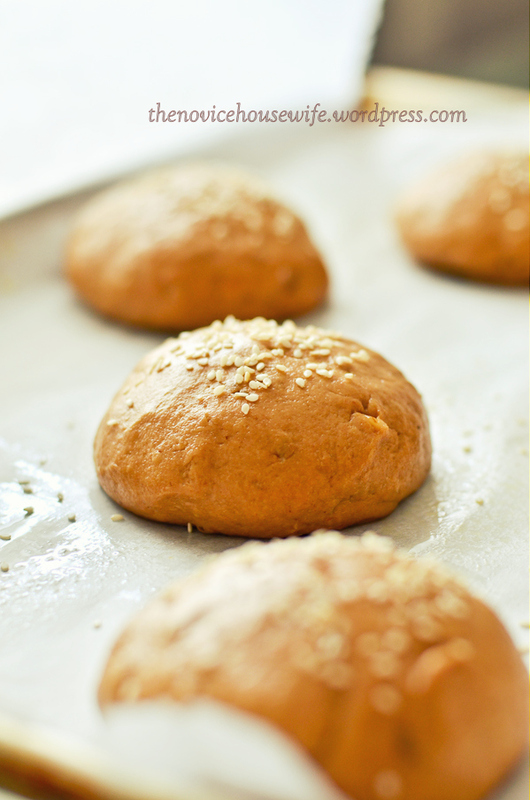 Your little buns are so cute and healthy a much better alternative.